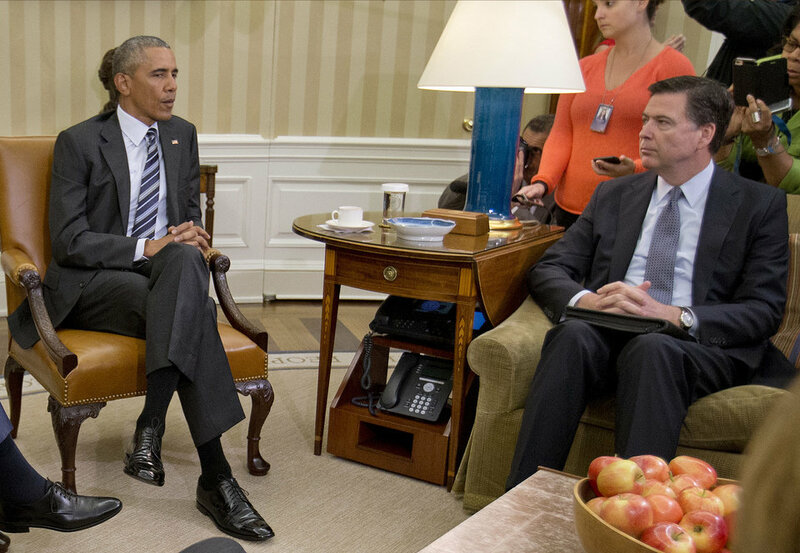 Over the past five years, a range of articles on this weblog covered the secure and non-secure phones used by president Barack Obama, whether in the White House, at his Summer residence or aboard Air Force One. 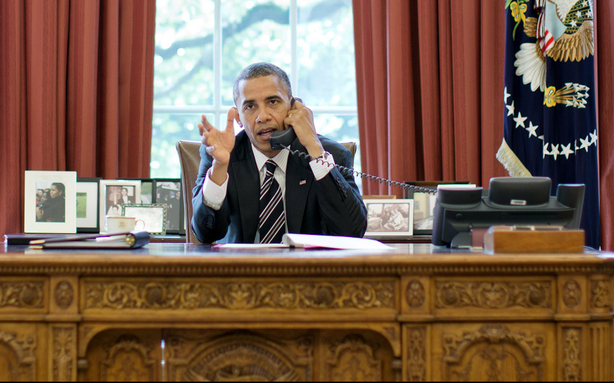 With Donald Trump taking over the US presidency in a few days, it's a good moment to look back and provide a comprehensive overview of the communications equipment during Obama's time in office. Additional context for this was provided by a background story from the New York Times from April last year, as well as by several other sources, which show an almost complete overhaul of the communication systems of the Obama White House. For the communications systems used by the president of the United States it was more important to be reliable, than to be up-to-date, and so the equipment often served decades, almost until the moment that there are few officials left who know how to maintain it. "The President told us he was frustrated with the poor communications that morning. He could not reach key officials, including Secretary Rumsfeld, for a period of time. 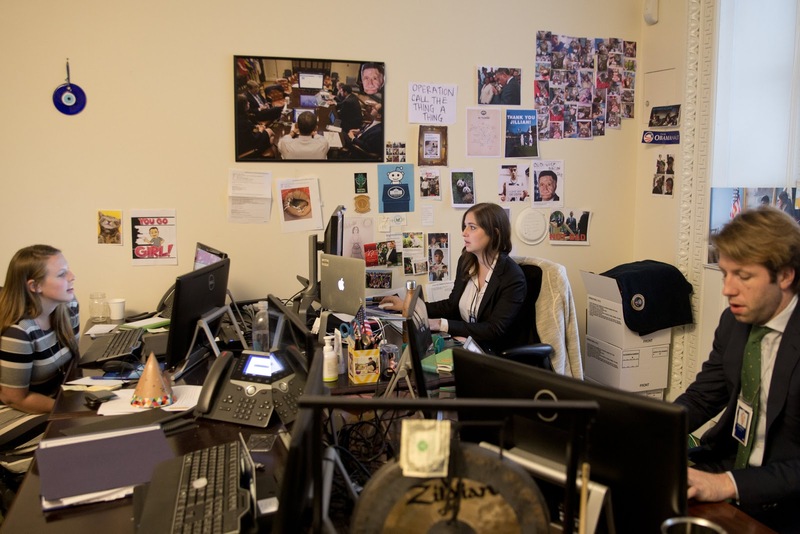 The line to the White House shelter conference room and the Vice President kept cutting off." These failures led to an overhaul of communications systems and the installment of new equipment. 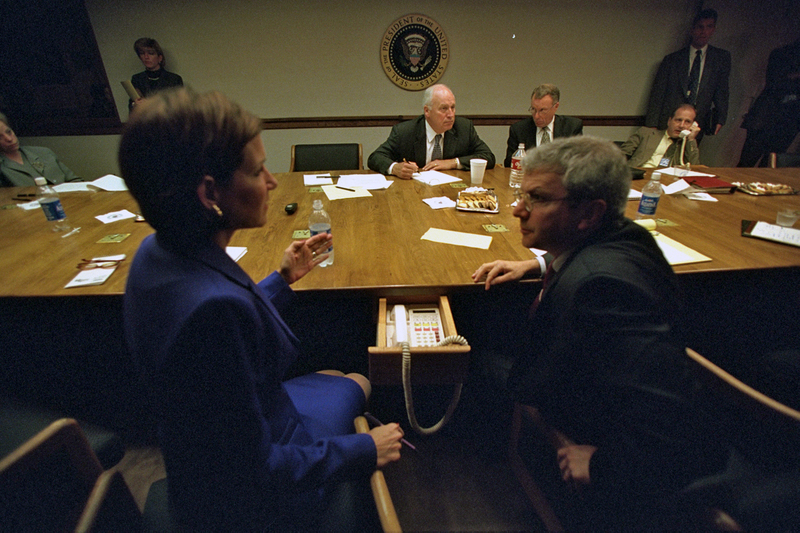 Bush' deputy chief of staff Joe Hagin ordered for example the upgrade of the Intel 486 computers, replacement of the slow and cumbersome Lotus Notes e-mail system, and White House staff members started using the first BlackBerries. 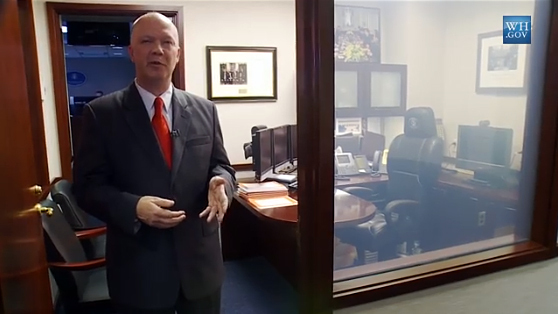 Video about the White House Situation Room. December 2009. Simultaneously, a new and highly secure telephone system was established that should prevent failures like on 9/11: the Executive Voice over Secure IP-network, which connects the president with all major decision makers, like the secretaries of State, Defense and Homeland Security and the Director of National Intelligence. For this network, common Cisco 7975 unified IP phones are used, but instead of the bezel or faceplate being standard silver, it's bright yellow, which is the color code for the highest classification level: Top Secret/SCI. The phones themselves have no encryption capability, there are separate network encryptors, probably from General Dynamics' TACLANE familiy. Before this new IP-network was installed, the president's secure phone calls went through the Defense Red Switch Network (DRSN), which is the secure telephone network for the entire US military. In 2001, the DRSN was still circuit-switched, but its special multilevel precedence and preemption (MLPP) functionality couldn't prevent the glitches during the September 11 attacks. - A black Avaya/Lucent 8520T, which is for the internal White House telephone network that was installed in 1996 and can be used for all non-secure phone calls. - A dark gray Cisco 7975G Unified IP Phone with expansion module 7916, which is for the highly secure Executive Voice over Secure IP-network, but instead of the yellow faceplate, the phone in the Oval Office has the standard silver one, probably to make it not stand out too much. Although this phone came on the president's desk under Obama, the system itself was already operational since 2007.
for non-secure and the gray IST-2 for secure phone calls, May 24, 2010. Left of the television there's a smaller Avaya/Lucent 8410D. 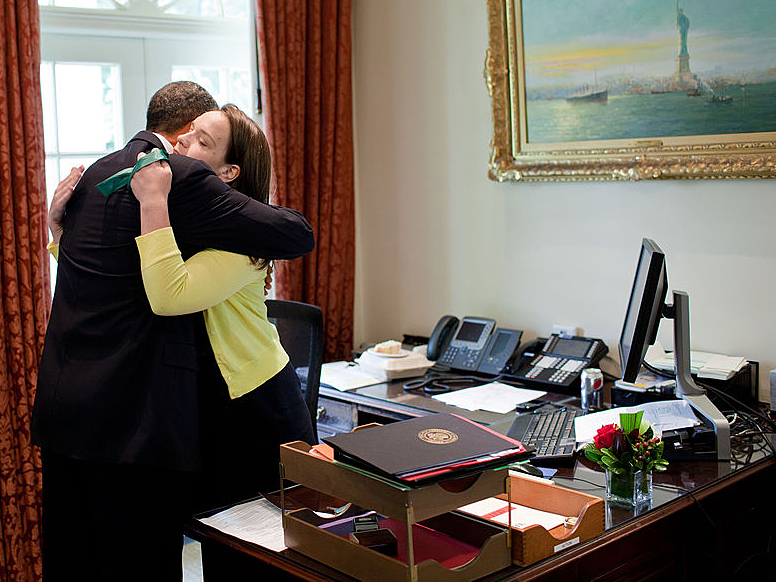 President Obama bids farewell to his personal secretary Katie Johnson. June 10, 2011.
with a black Avaya/Lucent 8520 and the Cisco IP phone with yellow faceplate. Also note the white file cabinet with KABA MAS high security lock. In March 2011, president Obama received an iPad 2 directly from Apple founder Steve Jobs ahead of the commercial release. As of January 31, 2012, this device was used to provide Obanma with portions of the President's Daily Brief (PDB), a summary of the most important intelligence assessments. This electronic way of delivery allows analysts to add video and audio clips and interactive graphics. For security reasons, the wireless connections of the president's iPad are disabled. Immediately after becoming the 44th president of the United States in January 2009, a problem arose with the BlackBerry that Barack Obama was almost addicted to before he was elected. The president using a BlackBerry was considered a big security risk, as foreign intelligence agencies could easily track the president's movements and intercept his communications. Obama definitely wanted to keep his BlackBerry, so the White House Communications Agency (WHCA) and the National Security Agency (NSA) came up with a solution: in cooperation with engineers from BlackBerry manufacturer Research In Motion (RIM) they secured a set of regular BlackBerries with the SecurVoice application. Somewhere in May or June 2009, this highly secured BlackBerry was delivered to president Obama as well as to a group of up to twenty people with whom he liked to stay in close contact with. This because it's only possible to have secure communications if both ends are using the same encryption method or device. traveling to the airport in Jakarta, Indonesia. November 10, 2010. As of 2009, the White House Communications Agency (WHCA) started upgrading its Washington Area System network, modernizing six network switches in Washington, transiting secure telephone units to IP-based phones, purchasing 24 secure deployable voice switches, upgrading narrow and wideband satellite systems, and conversing the radio network used for presidential travels to an IP-based system. As part of the Senior Leadership Communication System (connecting the president, vice president, Congress, secretary of Defense, chairman of the Joint Chiefs, etc.) the WHCA established a nationwide network that would survive a high-altitude electromagnetic pulse (HEMP) from a nuclear blast. This network would consist of fiber-optic rings with redundant connections with HEMP and non-HEMP networks. For all this, the WHCA asked an extra $ 24.7 million for its 2009 procurement budget, which also included upgrading the Head of State network to an IP-network. This system is used by the president to communicate with foreign leaders, but unfortunately we have no additional information about it, so it's not clear which heads of state are connected to it and whether and how it is secured. "can make a head-of-state phonecall from the Situation Room itself"
"I always thought I was gonna have like really cool phones and stuff," and: "We can't get our phones to work." Acting out his exasperation: "Come on, guys. I'm the president of the United States! Where's the fancy buttons and stuff and the big screen comes up? It doesn't happen." 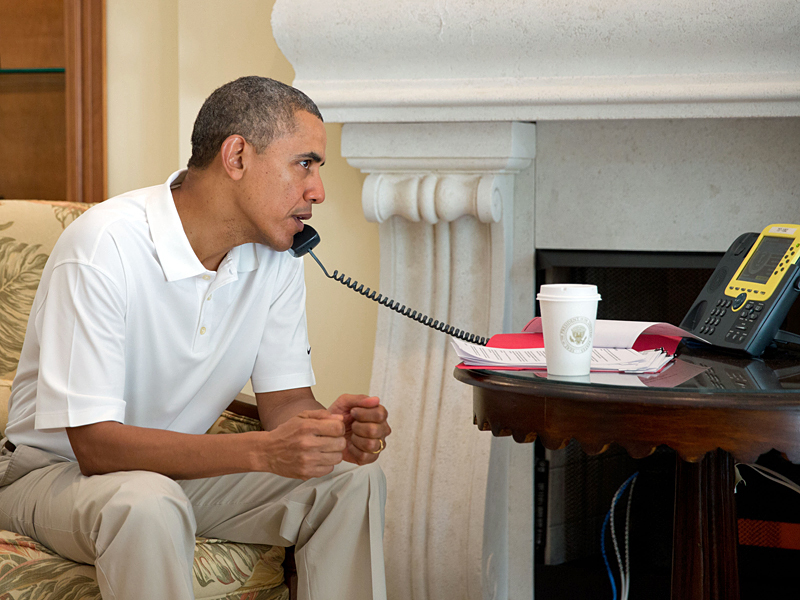 > See also: Does Obama really lack cool phones? Although this wasn't really the case for the president's own equipment, it did apply to other White House employees. 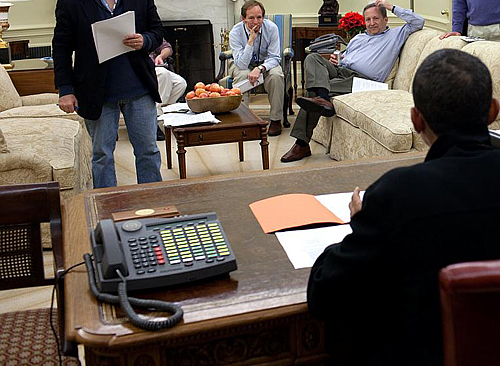 The New York Times reported that West Wing aides were stuck "in a sad and stunning state of technological inferiority: desktop computers from the last decade, black-and-white printers that could not do double-sided copies, aging BlackBerries (no iPhones), weak wireless Internet" and desktop phones from the mid-1990s. That led to a series of Band-Aid solutions over the years, as one agency or another has attempted piecemeal upgrades to White House gear. 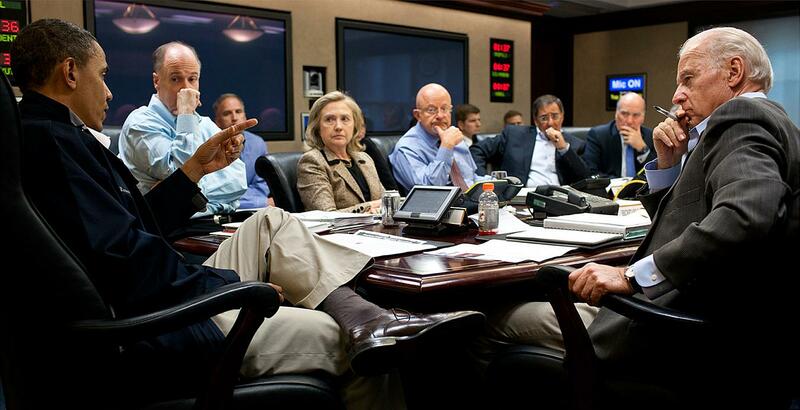 in the Situation Room discussing the mission against Osama bin Laden" - May 2011. On the table we see the Cisco with yellow faceplate and an STE secure phone. Even in March 2016, when a full IT modernization had already started (see below), Obama said that the pop-culture depiction of presidential-grade technology and the real world are far apart: movies and TV shows "make it appear as if I’m in the [Situation] room and moving things. [We] have half a finger print and a half an hour later I’m tracking a guy on streets of Istanbul. Doesn’t work that way, no. Sometimes I’m just trying to get a connection." 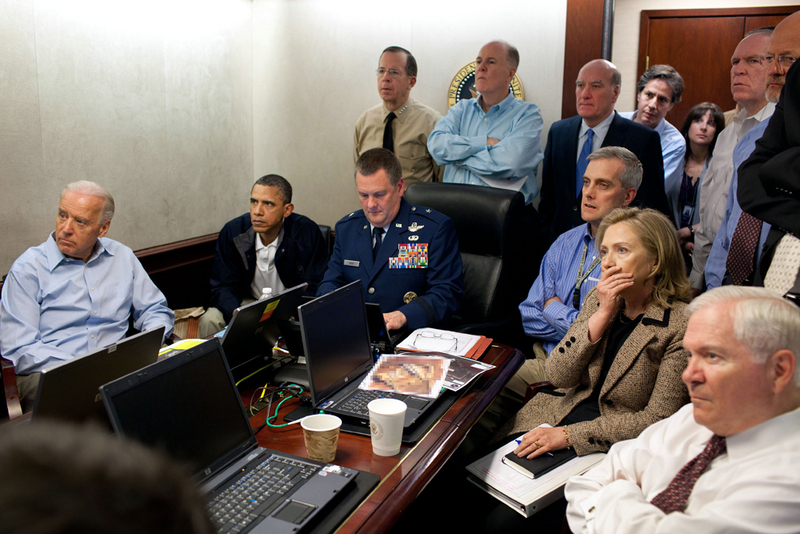 following the operation against Osama Bin Laden. May 1, 2011. With quite some improvements of the ground-based communications systems, the equipment aboard Air Force One was still lagging behind. For their modernization, an $ 81 million contract was awarded to L-3 Communications in 2009. This included replacing outdated analog systems, providing fixed bandwidth switching and integrated secure/non-secure video teleconferencing. 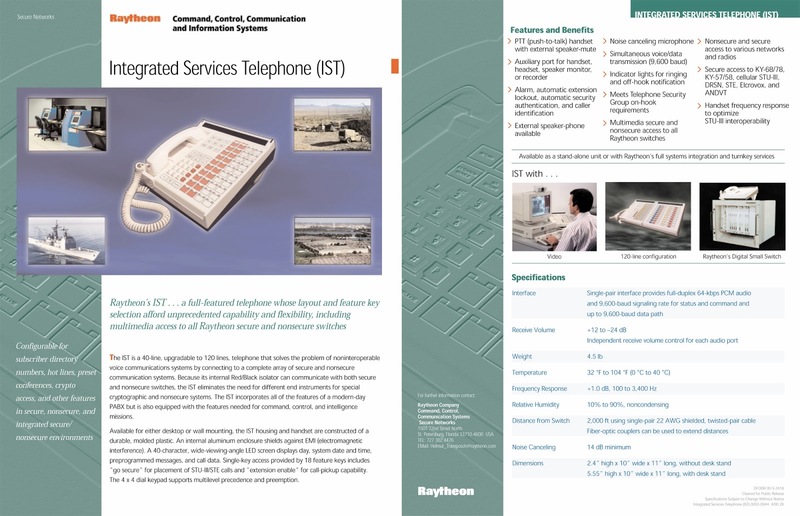 By August 2012, all the old phone sets from the 1980s had been replaced by the Airborne Executive Phone (AEP), which is able to make both secure and non-secure calls from a single handset. It also provides Multiple Independent Levels of Security (MILS) for digital voice and internet data access. 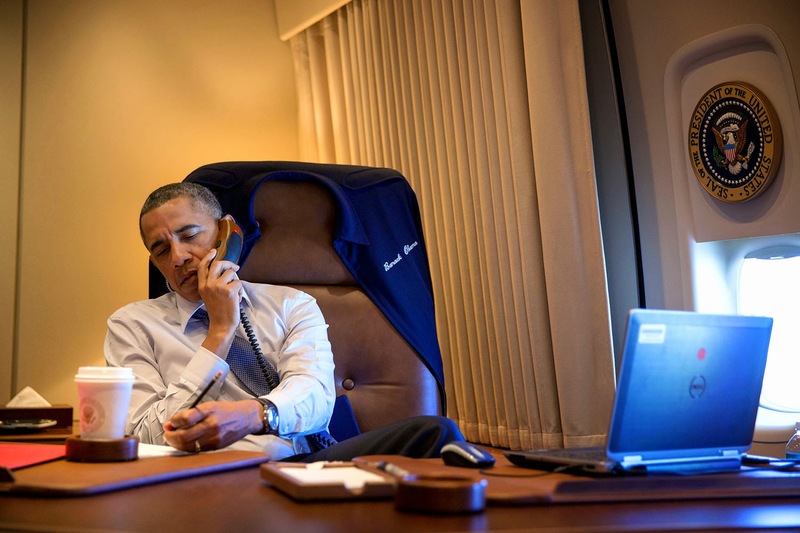 President Obama talks on the phone aboard Air Force One. April 10, 2014. The Airborne Executive Phone has the red light on, which means it's a secure call. After the upgrade of the phone system, administration officials still had to sent e-mails over an air-to-ground internet connection that was often no better than dial-up modems from the mid-1990s. 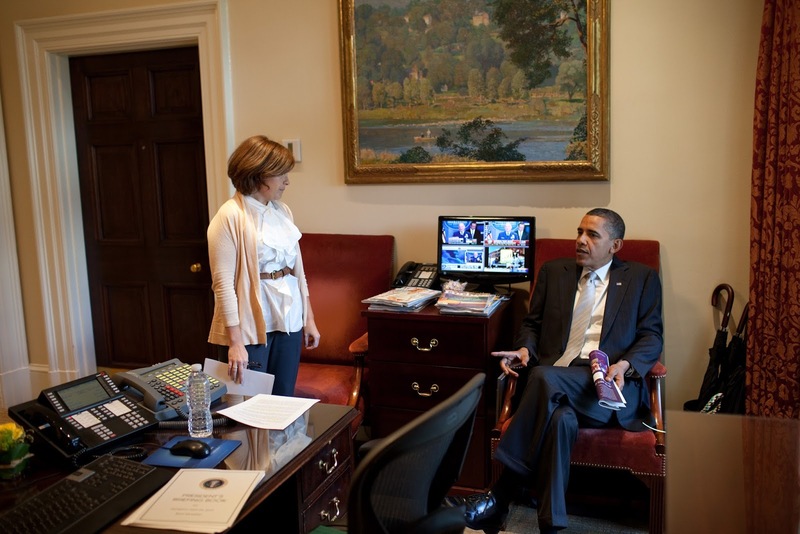 Current White House deputy chief of staff for operations Anita Decker Breckenridge told The New York Times that this wasn't acceptable anymore and that she has since worked with the Air Force to upgrade the president’s plane to broadband speeds: "This is the Oval Office in the sky. Talk about a network that didn’t work." 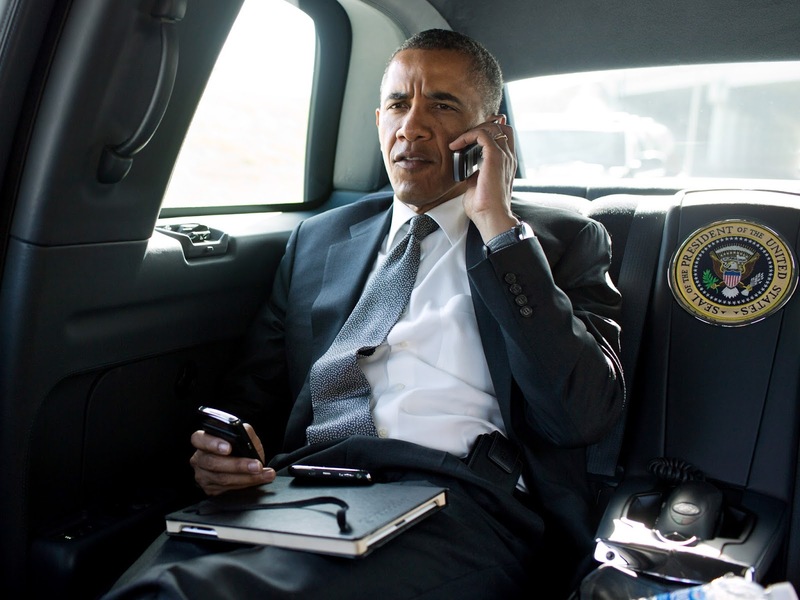 The Airborne Executive Phone was also installed in the presidential limousine: in the next picture we can recognize a dark gray version of the device between the seats, underneath the presidential seal. 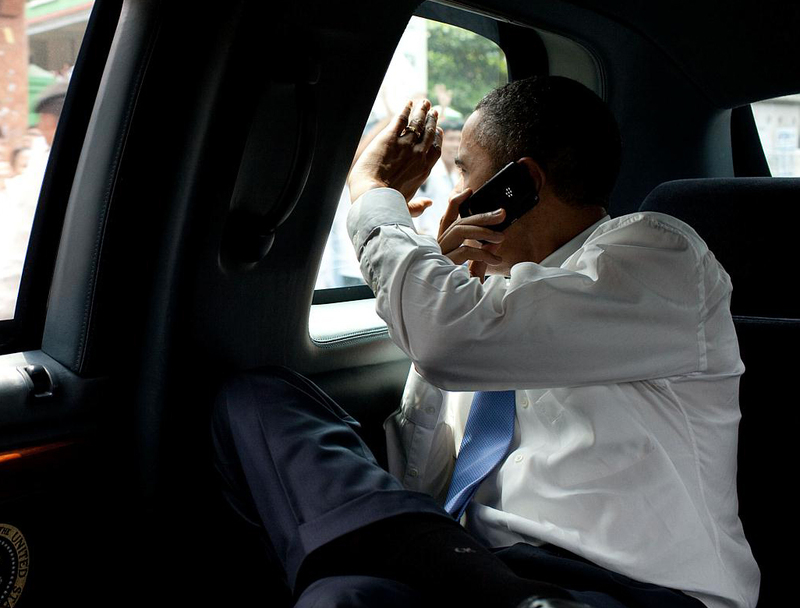 President Obama seems to be using a Motorola RAZR flip-phone, for which there's a cradle right next to the side-window. motorcade ride to Palm Beach International Airport. July 20, 2012. 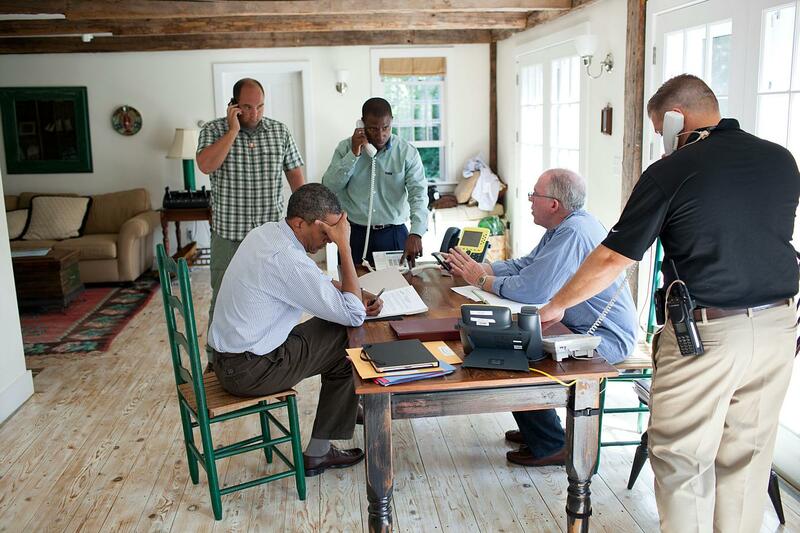 "Presidents don't get vacations, they just get a change of scenery" - so when president Obama was on Summer vacation at the Blue Heron Farm in Chilmark on the island of Martha's Vineyard, the White House Communications Agency (WHCA) would install all the necessary equipment, especially for secure communications. 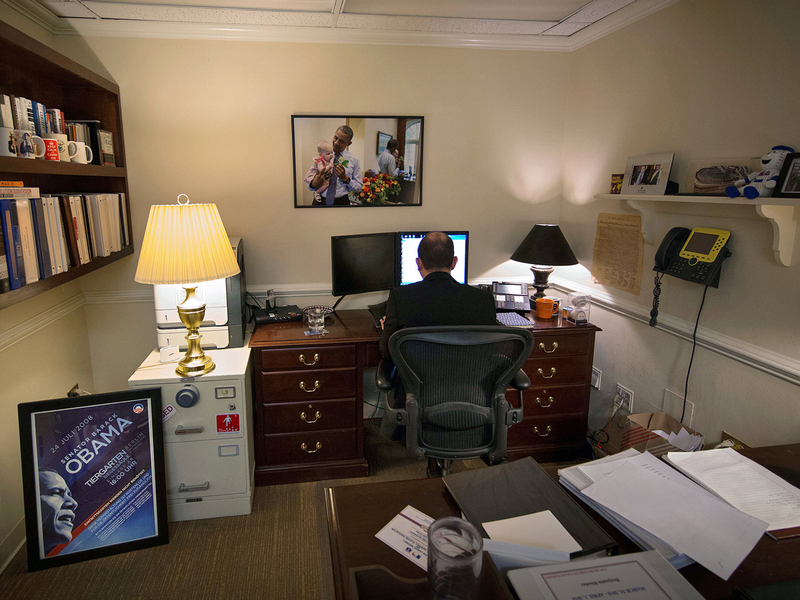 The New York Times reported about a situation during Obama's Summer vacation in 2014: when White House aides accompanying the president struggled with their laptops as they tried to revise a presidential statement, they could not get on-the-road tech support from the WHCA because the agency’s staff members were not authorized to log in to computers issued by the Executive Office of the President. After this incident in Martha's Vineyard, White House deputy chief of staff for operations Anita Breckenridge was determined to finally fix the mess of the presidential communications systems. 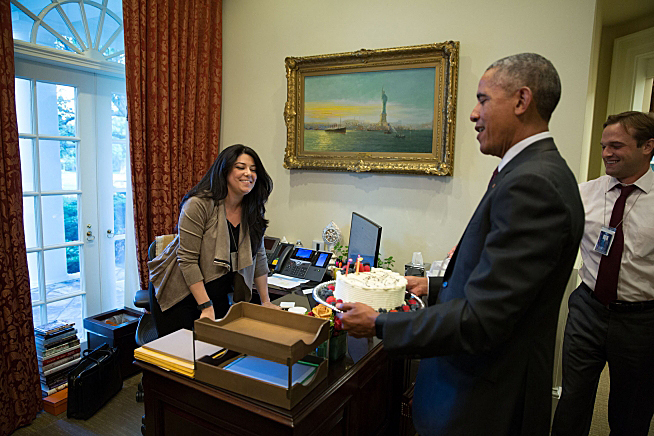 By March 2015 she had hired David Recordon, who designed and maintained the office technology for Mark Zuckerberg and the other employees at Facebook, to modernize the White House IT systems. Just 28 years old, he was appointed as the first Director of White House Information Technology. "It was an interesting challenge and world for me" according to Recordon. For this overhaul, the White House didn't need to request additional money - it was paid out of the existing technology budgets for the various agencies involved. In some cases, money was saved by eliminating duplications: the four agencies involved no longer negotiate their own contracts with cellphone companies and no longer buy duplicate copies of software licenses. black Avaya/Lucent 8410 phones, a computer screen and an HP laser printer. March 2009. After almost 20 years, the old internal White House telephone network with the black Avaya/Lucent telephones was replaced by a new IP-based system with the latest Cisco IP phones from the 8800-series. These phones have full-color (video)screens, WiFi and Bluetooth connectivity (although likely disabled for security reasons), and speed-dial buttons that can be configured online - for the old desktop phones only few staff members knew how to program them. 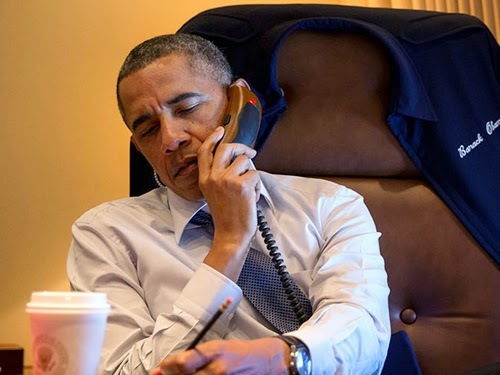 Many White House aides now carry the most recent iPhones, but Obama still carries his own specially modified BlackBerry. 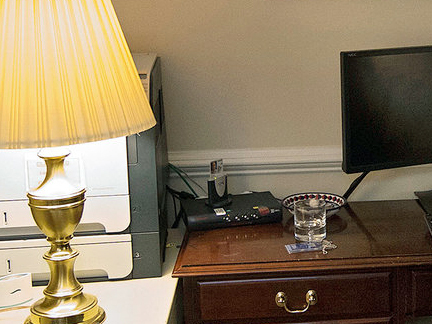 This Avaya IP phone was also placed underneath the side-table in the seating area of the Oval Office, as can be seen in the following picture. 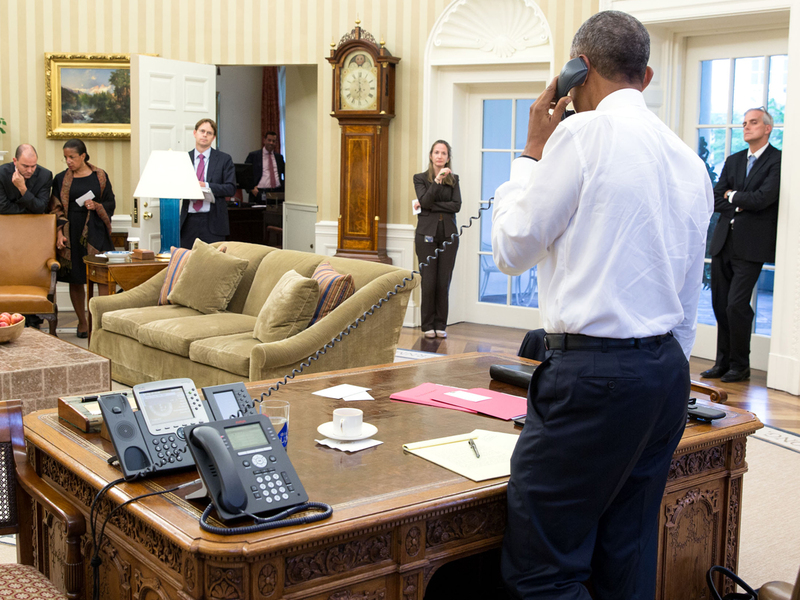 In the seating area there's always the same set of telephones as on the president's desk, but when the president makes a phone call, he usually uses the ones on his desk. 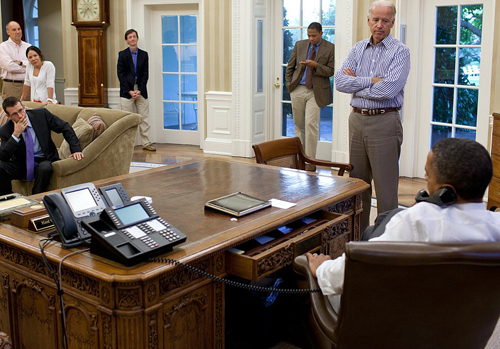 The phones in the seating area can then be used by his aides or advisers to listen in to the call. 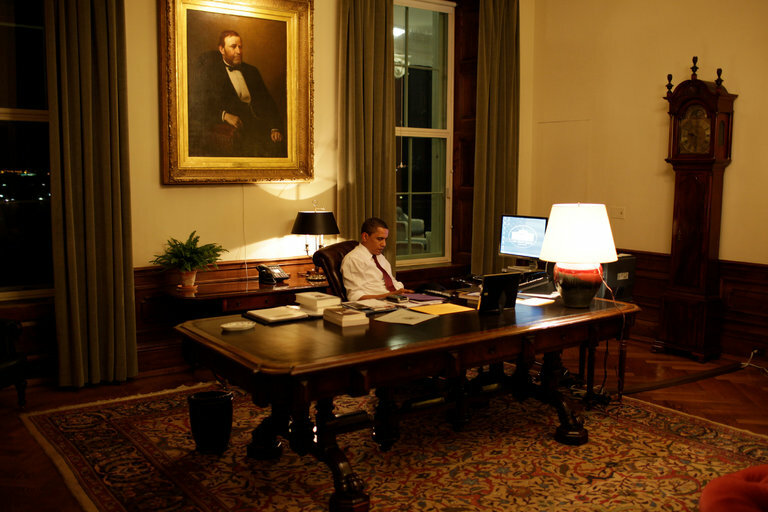 However, in November 2016, the Avaya phone underneath the side table had been replaced by the more futuristic looking Cisco IP phone from the 8800-series, but on the president's desk there still seems to be the simpler Avaya device. after the 2016 presidential election, November 9, 2016. 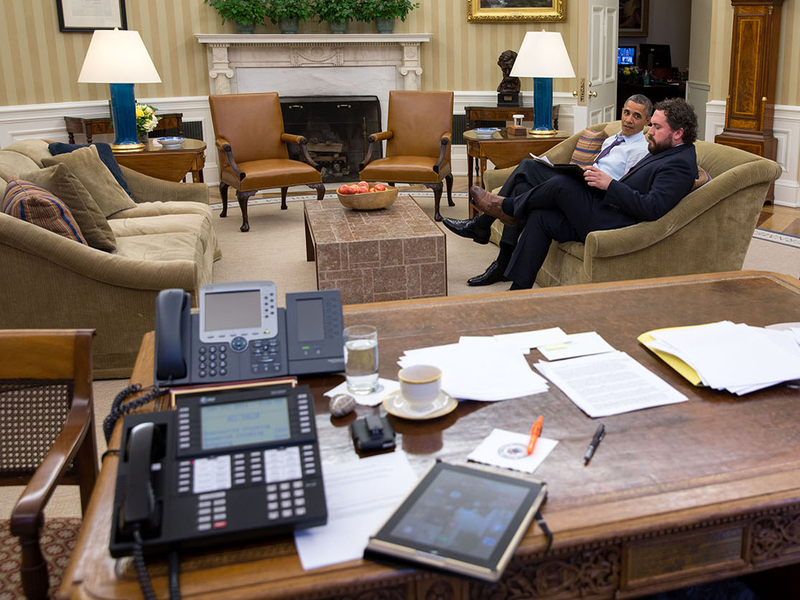 A close look at the high-resolution version of a photo from December 24, 2016, shows that also on the president's desk, the Avaya phone has been replaced by what can be recognized as the new Cisco from the 8800-series, with some kind of module on the back. screen and keyboard with integrated smartcard reader. January 20, 2017. 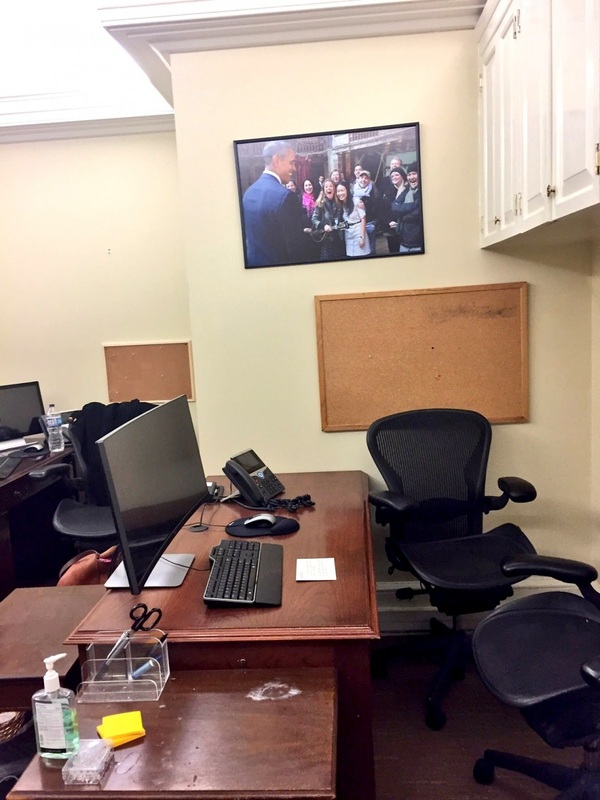 Besides the new telephone system, director of White House Information Technology David Recordon also installed a new computer network. The New York Times reported that first he tried to map the miles of Ethernet cables and phone wires inside the walls of the White House. His team of technicians eventually discovered and removed 13,000 pounds of abandoned cables that no longer served any purpose. "They had been installed over the decades by different organizations using different standards, different techniques, from different eras" Recordon said. "They were finding these pipes that just had bundles of cable that had been cut off over the years, no longer used. So we just started pulling it out." With the wiring fixed, Recordon started replacing the old computers by new ones with fast, solid-state drives and fast processors, as well as installing color printers. The WiFi is now made strong enough to live-stream for example an event on Facebook from the Roosevelt Room. And finally, the White House has started requiring users to log on to their computers with two-factor authentication using a smartcard and a pincode. PK: Another great article. Avaya does have 2 Telephone Security Group phones, as can bee seen here on this link: The CIS-Secure Co phones, which are variants of Cisco phones (TSG approved), some are low-power by the network (and battery) as opposed to using an AC Mains w tranformer. Yes, the Avaya TSG phone (the middle phone) , and CIS-Secure phones both need encryption boxes. Some voice communications are Voice over Internet Protocol (VoIP), apparently. Thank you for the comment and noticing the TSG approved devices! It appears that CIS Secure also has a TSG approved version of the Cisco 8841 IP phone that is on the president's desk: http://www.cissecure.com/products/tsg-class-a-approved-cisco-8841-1-gb-fiber-enabled-voip-phone So this must be the additional module on the back of that phone. I will update the article accordingly. There are some additional phones at this site which are unidentified. Yes, those are the ones used at locations the president visits while traveling. Those phones will be described in a separate article later on. Can you also identify the phone here? The cisco I recognize.the other looks like there's something attached to the back. US Marines did not kill Osama Bin Laden, rather US Navy SEALs did. 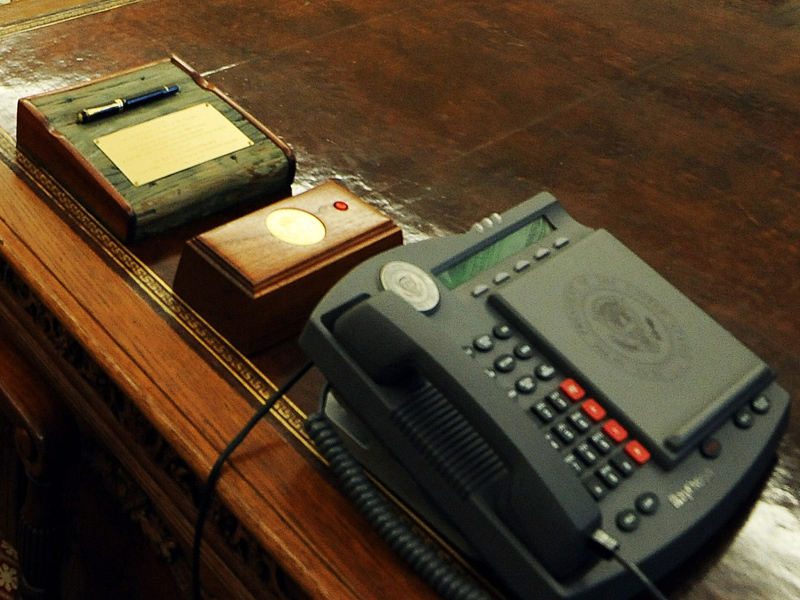 @ ANON: The other phone on the president's desk is a newer Cisco 8841 IP Phone. The box on the back is a modification by CIS Secure Computing so the device meets Telephone Security Group (TSG) standards, like on-hook security for the headset and speakerphone. @ Anonymous: You are right, it were Navy SEALS, I will correct it. Telephone Security Group (TSG) standard 5 for on-hook security is to make sure that a telephone device cannot by any means be caused to produce or transmit audio when the handset is on-hook - whether accidental or deliberate. For this, the telephone's internal components must be situated so that the instrument's on-hook isolation cannot be easily or covertly bypssed. The layout of the internal components and connections must also facilitate inspections to find potentially compromising modifications. That's very well spotted - thank you! I will correct the article accordingly. Very good post, and I like your points. However I do think that lists still have some merit, but the poster should try to make the list.